Read the full sign-on letter. As the European Bank for Reconstruction & Development (EBRD) releases the latest draft of its energy sector strategy and the European Investment Bank (EIB) prepares to review their energy sector lending criteria later this year, 65 civil society groups from 28 countries released an open letter being sent to top EBRD and EIB officials demanding that they stop financing oil, gas, and coal projects. 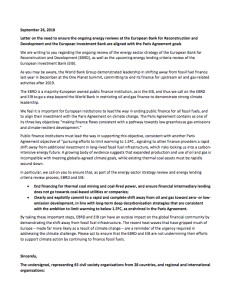 The letter emphasises how as major European institutions, the EBRD and EIB have a responsibility to meet and exceed the World Bank Group’s recent commitment, made last year, to end all financing for oil, gas, and coal extraction. Anything less than meeting that standard would be a severe abdication of these European institutions’ climate leadership. Signatories including Bank Information Center Europe, Bretton Woods Project, CEE Bankwatch, Center for International Environmental Law, Christian Aid, Counter Balance, E3G, Food & Water Europe, Friends of the Earth Europe, Global Catholic Climate Movement, Global Witness, Oil Change International, urgewald, ZERO, and 350.org were part of the 65 organisations from 28 countries around Europe and the world who signed the letter. Click here to read the letter and full list of signers.